RingCentral Contact Center is a comprehensive communications system built to assist businesses of all sizes in managing their customer engagement efforts. This system aims to revolutionize your customer relationships through a robust collaborative contact center for customer engagement. It offers tools for smart routing, customer survey application, performance management, workforce management, quality management, and speech and text analytics. With RingCentral Contact Center, you can take advantage of an omnichannel platform to get in touch with customers using their preferred devices at the right time and moment, allowing you to communicate via voice call, SMS, social media, or email. Omnichannel routing is also supported and easily configurable based on skill-based parameters, ensuring that your most qualified agents handle each client. RingCentral Contact Center is a cloud-based system that also offers real-time reporting and powerful analytic capabilities. With this, you can gain a better understanding on your operations and achieve meaningful improvements in service. Important alerts and notifications can be configured so lackluster performance and inefficiencies are quickly expedited. The quality of customer service you give relies on the performance of your agents. If you are looking to improve the way your contact center agents work, RingCentral offers a multitude of features to help you. From skill-based routing to real-time call monitoring, this system will allow you to make your customer interactions more efficient and personalized. It even has interactive voice response options and self-service capabilities that can help you gather additional customer information. If that’s not enough to help you reinforce your operations, RingCentral Contact Center also has CRM integrations so you your agents can get the right data at the right time. As for your supervisors, this platform offers performance management features that they can access via dashboard. This is equipped with analytics tools and tracking options that will let you determine how to better delegate workload and maximize the time of your employees. Gamification tools may also be sued to drive agent performance. Contact center operations can be quite complicated as it requires you and your agents to have a deep knowledge of your products and services as well as understand the concerns of your customers. On top of that, you need to ensure that the right calls are being forwarded to the right people. To help you accomplish this, RingCentral Contact Center allows you to configure extensions, manage call forwarding, routing, or blocking, and enable auto call attendants in a systematized way that can be customized according to your preferences. It also automates various mundane processes to help you get more things done with less effort. Modern technology has opened up new modes of communication. While this makes it more convenient for you to stay in touch with clients and leads, it can be difficult for you to manage your contact center operations. Using RingCentral Contact Center, you can consolidate customer interactions across channels by integrating all of your communication tools into a unified platform. This way, you can utilize multiple communication tools like voice calls, SMS, social media, or email for your operations without having to jump from system to system. Every second counts when it comes to managing a contact center. This means, if you experience any sort of downtime for whatever reason, you can easily lose clients. This is why RingCentral Contact Center was designed for business continuity in cases of poor, but even completely lost Internet connection. The application simply switches to cellular voice and data networks whenever problems happen, so that your agents and administrators can continue with their tasks without any disturbance. The vendor also offers a 99.99% uptime guarantee. Another great thing about RingCentral Contact Center is that it offers a straightforward software implementation that doesn’t take up too much time. It is known for having a user-friendly interface that is built in such a way that you won’t need to consult technicians or hire experts in order to implement. Additionally, the platform can easily handle complex phone configurations, making it easy for both professional and novice users to make the transition from the traditional call center setup to the more modern one without the need for extensive training. There are well-liked and widely used applications in each software group. But are they necessarily the best fit for your organization’s unique requirements? A trendy software application may have thousands of users, but does it offer what you require? For this reason, do not blindly spend on popular systems. Read at least a few RingCentral Contact Center reviews and think about the elements that you want in the software such as the price, main tools, available integrations etc. Then, shortlist a few systems that fit your wants. Check out the free trials of these apps, read online reviews, get clarifications from the maker, and do your research thoroughly. This exhaustive groundwork is certain to assist you select the finest software solution for your organization’s unique requirements. 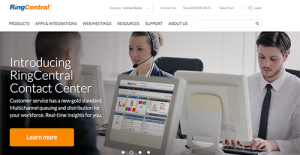 How Much Does RingCentral Contact Center Cost? We realize that when you make a decision to buy Call Center Software it’s important not only to see how experts evaluate it in their reviews, but also to find out if the real people and companies that buy it are actually satisfied with the product. That’s why we’ve created our behavior-based Customer Satisfaction Algorithm™ that gathers customer reviews, comments and RingCentral Contact Center reviews across a wide range of social media sites. The data is then presented in an easy to digest form showing how many people had positive and negative experience with RingCentral Contact Center. With that information at hand you should be equipped to make an informed buying decision that you won’t regret. What are RingCentral Contact Center pricing details? What integrations are available for RingCentral Contact Center?